You are here: Home / Western New York State of Mind / Bring Back Crispy M&M’s®! They disappeared without much fanfare in 2005. I barely noticed it, but, then again, I don’t often buy M&M’s®. When I did, I usually did it only to fill treat bowls for the holidays. But Crispy M&M’s® Crispy remained my favorite of the brand. 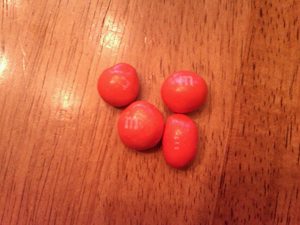 You’d think they might have been the favorite of the manufacturer, since, according to the Wikipedia entry (as of July 18, 2010), they brought in more profit than any other M&M® variety (caveat emptor, Wikipedia contains no reference for this “fact”). Just in time for Christmas – is that why I first noticed them? – Crispy M&M’s® came into being in December 1998, the company’s first new flavor since 1954, when it introduced Peanut M&M’s®. Most folks, though, probably remember the debut of the paranoid “Orange” character in an ad that aired during the 1999 Superbowl. Well, now M&M/Mars has decided to create an alter-ego in similar blue packaging. These faux-Crispy M&M’s® are, in reality, chocolate covered pretzels. Now, like any honest American, I like pretzels and I like chocolate, but I loathe chocolate covered pretzels. There’s something seriously disturbing about that (to allude to an old M&M’s® commercial). I say, boycott the pretzels and bring back the Crispy! Who’s with me? Any of you remember the “Cows on Parade” phenomenon that swept the country and the world? Do you realize it started right here in Western New York? In 1990, the prototype for the Cow Parade – dubbed “Candy” – made its global debut at the Erie County Fair (which I will always call the “Hamburg” Fair in deference to my home town). This famous fiberglass female was featured at the M&M® exhibit at the Fair. Covered with 66,000 M&M® chocolates, the cow brought the candy manufacturer more than $1 million in free publicity. Newsweek call the 8 foot bovine “udderly amazing.” Regis Philbin even “interviewed” the chocolatine model. Fair goers waited in line for up to thirty minutes to view the year’s most popular exhibit. Were you one of them? Candy inspired the Cow Parade mania, where some of the world’s largest cities surrendered to the fad, including Zurich, Taipei, Rome, Hong Kong, Chicago, New York, London, Sydney, Houston, Las Vegas, Atlanta, San Antonio and even Lima, Peru. And, to think, it all started right here in the Greater Western New York region. What’s your favorite trivia of how the Greater Western New York region impacted the world? Enter your comment below. one of my favorite legacies about Rochester New York is Susan B Anthony – and of course the dollar coin featuring Ms Anthony was only minted for four years, 1979, 1980, 1981, and 1999. 1. On November 18, 1872, Anthony was arrested by a U.S. Deputy Marshal for voting illegally in the 1872 Presidential Election – do I dare say she was a Federal Criminal? 2. Her family, like many others, was financially ruined during the Panic of 1837. I guess this would have been like filing bankruptcy. Nevertheless, her triumphs for others are truly valuable and its with great pride that we have a $1 coin featuring our Western New York native, Susan B Anthony. I’m so fond of her 1 dollar coin .. its one of my favorite coins to share with others – our kids get the coin in christmas stockings, easter baskets and dare i tell anyone, under their pillow from the tooth fairy. it was especially meaningful when I was in vegas last year for a network marketing convention – its a common practice to exchange ‘tokens’ or ‘souvenoirs’ from HOME and I gave out several of this coin to people from around the world. Deb, thanks for your comment. You know, for all her national exposure, I tend to forget Susan B. Anthony is from Western New York. The best thing about the coin, ironically, was its limited run – it made it easier (and less expensive) to collect the entire mint set!